Blending passion, creativity and confidence, Wurkhouse is a creative agency that embodies talent and innovation to produce inventive solutions for our international clients. Keyword research is at the core of any SEO, PPC or content marketing campaign. The keywords you choose to focus your efforts are critical to the success of your website’s rank. If you aren't bidding on or using the right keywords, you're not serving the right content to the right audience at the right stage in the buyer journey. Which means less traffic, fewer leads, and even fewer customers. Choosing the right keywords isn’t always easy and you need a lot of data to know whether a given keyword will work for you. There are so many keyword research tools available, it can be difficult to choose which one is best for you. In this post we’ll cover the best FREE tools available to help you with keyword research for your website content. 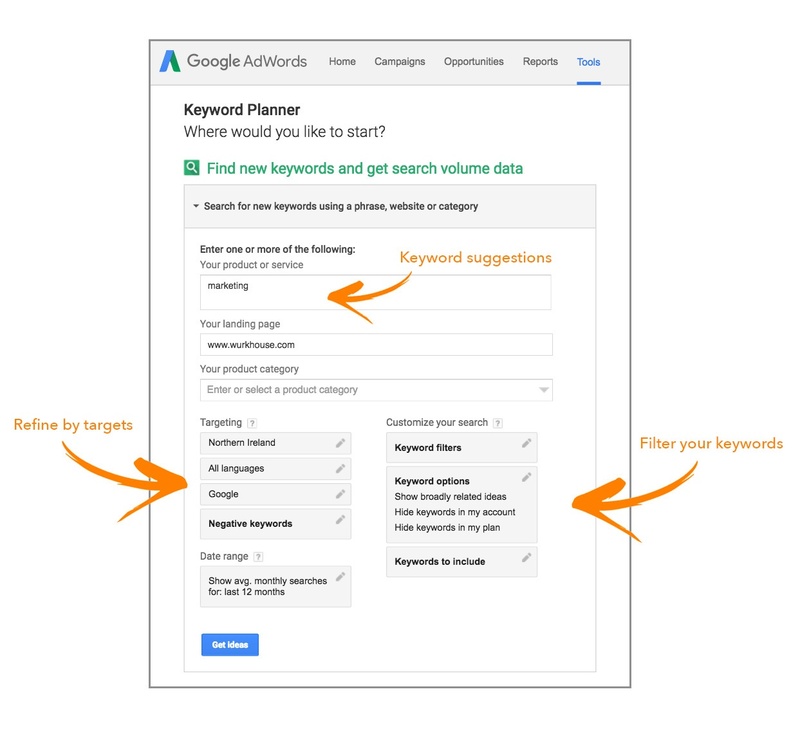 The Google Keyword Planner is a free tool found within the AdWords platform. It is the most popular and widely used keyword research tool there is. The keyword planner shows you average monthly search volume, level of competition and estimated cost-per-click for specific keywords. It also offers a range of filters including location, language and negative keywords so you can refine your results to be as precise as possible. As well as providing metrics for keywords you have input, it also has the ability to suggest new keyword ideas. So if you’re starting from scratch and you’re not sure which keywords you should be focussing on, simply input the URL of your landing page and the tool will produce a list of keyword ideas. ✔︎ This tool provides the largest range of related keywords because it is the most used and uses Google’s knowledge. ✔︎ You can input URLs of competitors to view the keywords they are ranking for. ✘ In addition to creating an account, you have to set up billing details before you can access the tool. You won’t get charged anything unless you start using AdWords but it’s a bit of a nuisance. Google Trends, another free tool from Google, allows you to input multiple keywords and refine results by location, category and search history. 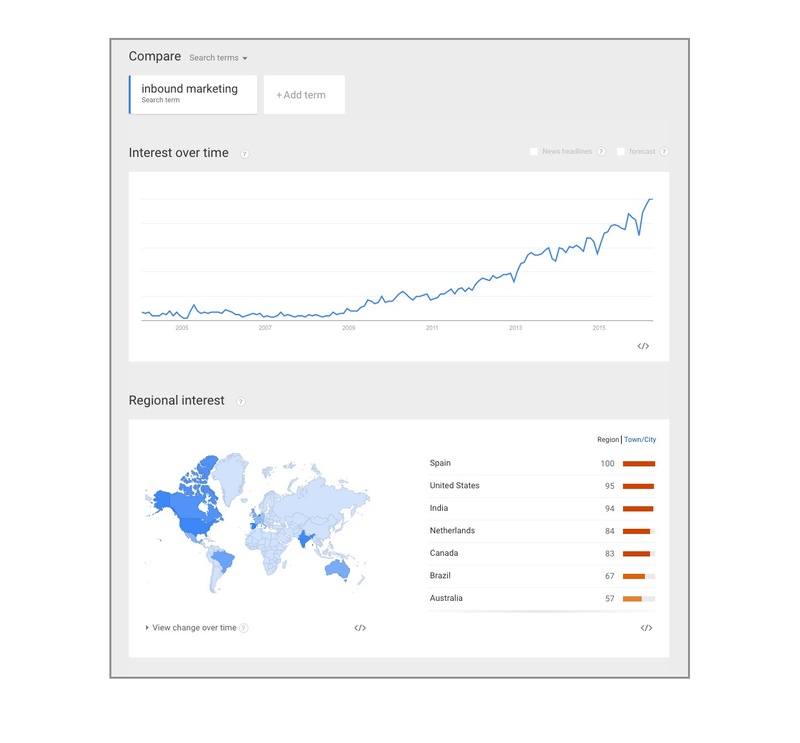 It also shows web interest on each keyword, such as the cause of the interest (e.g. press) and the traffic source. ✔︎ Trends produces interactive graphs that you can play around with, download and even embed on your website. ✘ Forecasts only show for web search- they are not available for image search, news search or product search. Keywordtool.io is a great tool for beginners. It’s very user friendly with a simple layout; it can provide 750+ keywords based on Google, Bing, Yahoo and the Apple App Store, all of which can be filtered by country and language. The Keyword Tool works by using Google’s auto-complete and UberSuggest’s letter adding features to produce a large variety of keywords. By extending seed keywords, the tool provides a great natural resource that can be used in your blog posts. ✔︎ The Keyword Tool shows the questions that can be created using your seed keyword. These provide great titles for new blog posts. ✘ The free version has holes- You have to upgrade to a paid version for information on PPC, search volume and keyword competitiveness. The KWFinder tool has a great free version as well as two premium options. Its shows you long tail keywords that have relatively low competition, which are easier to rank for. It allows you to search by country and language and it shows “interest over time” which tells you the popularity of the keyword overtime from 2004. Helpful additional information provided by the KWFinder is that is shows the top sites that rank for your term, as well as their social metrics. ✔︎ It shows trending information dating from 2004 for your keywords and the sites that are ranking in Google. ✘ You have to create a user account. ✘ The free version shows a limited number of results and you’re permitted to 5 searches a day. UberSuggest is a free keyword tool that has recently been acquired by Neil Patel. The tool has been recently upgraded to provide you with the data required to help you with a content marketing plan. 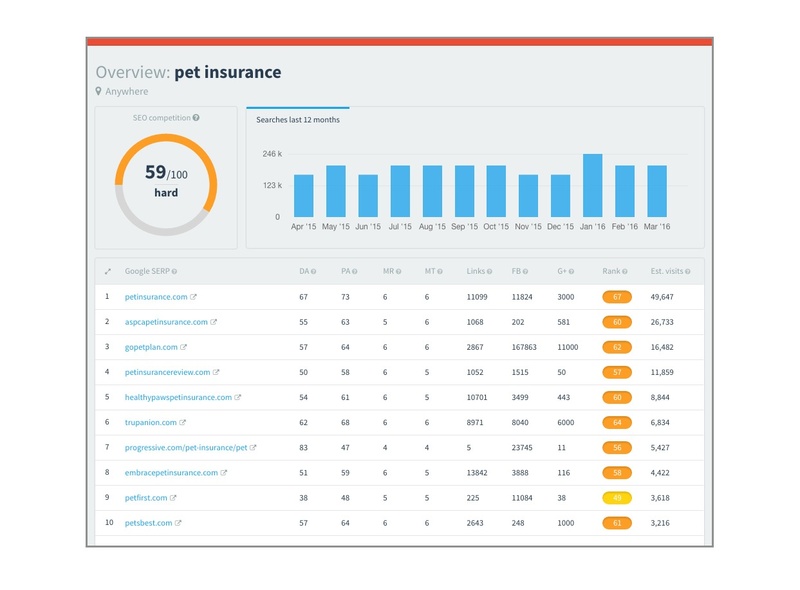 Ubersuggest is useful for SEO and PPC campaigns as you will get search volumes, CPC data, and ranking difficulty metrics. When you use this tool, you will also get keyword suggestions for related keywords and more. 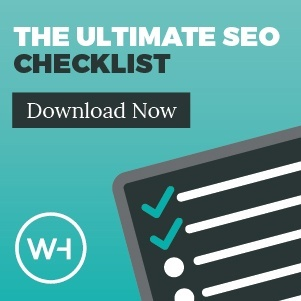 The new features that have been added to Ubersuggest have made this one of the best free keyword research tools that you can use for planning your content marketing and pay per click campaigns. ✔︎ Provides a massive number of keywords that can be further researched view search the terms in Google and expand the keyword to show further in-depth long tail variations. ✘ UberSuggest doesn’t provide any data on keywords your competitors are ranking for. ✘ Results can be slow to load up. 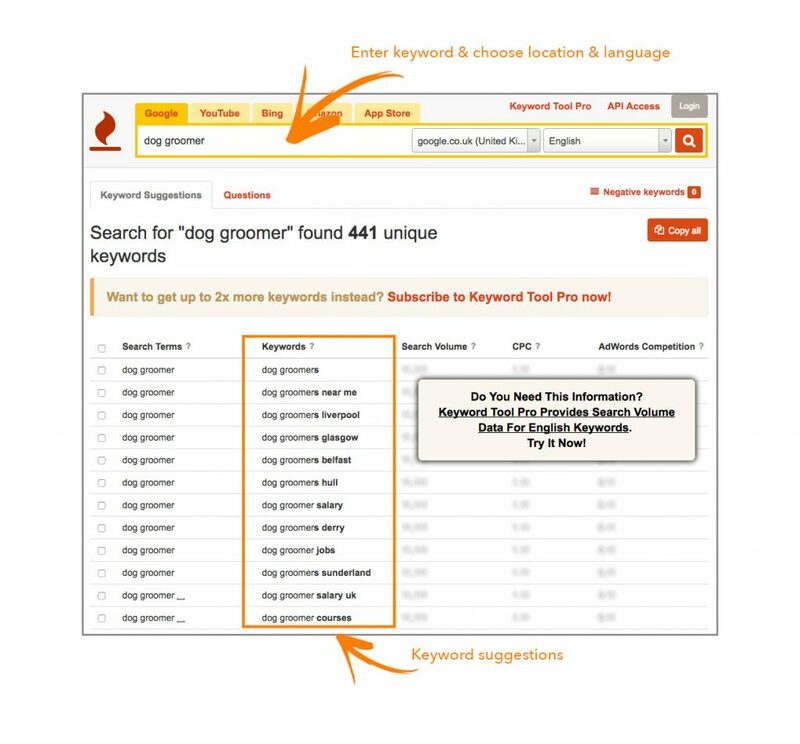 The keyword research process isn’t something you can ignore. The success (or failure) of a content marketing campaign hinges on finding the right keywords; They are responsible for the visibility of your content, helping users find you. We hope this list of free keyword research tools helps you to highlight the terms and phrases you should be ranking for.